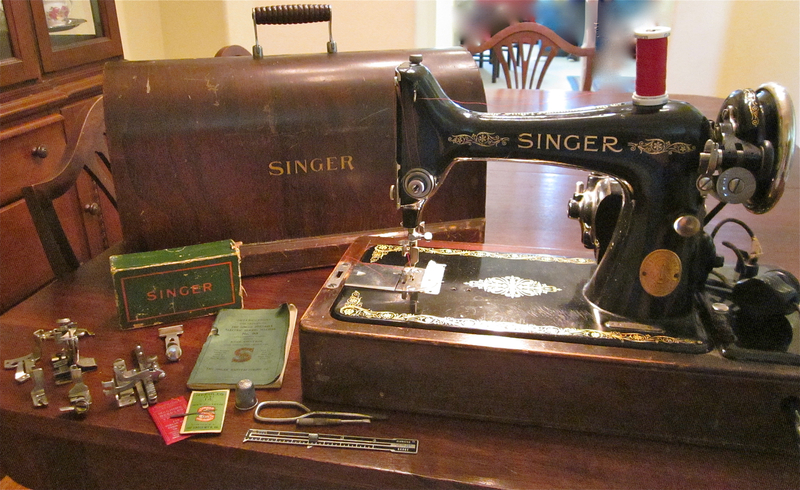 I was gifted a 1924 Singer 99 electric several years ago and recently had it serviced to be sure it was in good enough shape for me to sew a garment with it. The Singer 99 is a smaller and lighter version of the Singer 66. The skirt is complete, and it was a delightful experience to create it using only a vintage machine and hand-stitching. The moving parts just glide, particularly the hand wheel. When people say “like a well-oiled machine,” this is what they’re talking about. It has a wonderfully smooth motion. It’s gorgeous. It has a shiny black body with elaborate gold detailing and an embossed faceplate. It’s a pleasure to sew with something so pretty. I was able to connect to history in a real way. Although there are many bells and whistles available on new sewing machines to make sewing a little easier, the actual process of creating a garment isn’t really any different now than it was 91 years ago. I enjoyed experiencing sewing just the way people did back in the 1920s. The foot pedal. It was really hard to get used to operating the machine with a knee lever (really, a thigh lever). Ergonomically, I think it would take a while for using it to become truly comfortable, let alone second nature. When I put the Singer on my sewing desk, I unplugged the foot pedal from the Viking but left it in place, so I kept trying to use it out of habit! The reverse button. The Singer is just a few years too old to have a reverse lever on it. Starting and ending a line of stitches was a little cumbersome because at first I opted to flip the entire garment around in order to stitch backward then forward. After a while, I decided to sew forward about a half-inch, then raise the needle, move the fabric without cutting the thread, and restart the seam from the beginning. The presser foot button. I’m now accustomed to using a button to raise and lower the presser foot on my Viking. (There are three different heights I can raise it to!) Using a traditional back lever was not a problem except for its proximity to the exposed light bulb with metal shield on the back of the machine. Ouch, that’s hot! No zipper foot. At first I was dismayed to see that the Singer did not have a zipper foot among its accessories. Zippers were not yet used in clothing in the 1920s (according to Wikipedia anyway), which explains why it didn’t have one originally. (I could probably buy one that would work.) So, I sewed the zipper in by hand. This is my first time hand picking a lapped application; but in general, I’ve found that hand-sewn zippers are more successful for me than sewing them in by machine. The zipper slider isn’t in the way of a hand needle, so it’s easy to maintain a straight stitching line. I’m not particularly eager to sew another garment zipper in by machine. Now that the project is complete, the Viking is back on my sewing desk, but I have no doubt I’ll be using the Singer again. I’m thinking it would be wonderful to make a quilt with it. Next time, I’ll share the project that I sewed with the Singer.